Tales of a Trailing Spouse in Hong Kong: The cat's out of the bag. Well, the cats are out of...no they're not. Never mind. The secret's out. The cat's out of the bag. Well, the cats are out of...no they're not. Never mind. The secret's out. Having spent the last few weeks alternately panicking, napping and muching crackers to stave off the nausea, I think I am getting the hang of this at last. My Amazon order is in the post, I have been finding out more about how to exercise safely (although that's not stopped me from gaining weight!) and I have not had to fend off too many enquiries about my sudden tee-totalism and new-found "aversion" to sushi. Things are still very difficult because we are trying to make a decision about a new flat, and that's kind of hard when neither of us can really truly imagine what it'll be like to have a little squawking bundle around. How much space do we need? where will the buggy go? Would we get by ok without a bath? I'm just glad that we found out in time to veto all those lovely 4th floor walk-ups we saw! Also Oliver is coming to stay - by the time he comes, he will kow that sometime in May he'll be Uncle Ol, but part of me wants to tell him to wait until next year, since there'll be more to see then! But if he comes in Nov, it's cheaper as , and I'll still be able to leave the house (wherever that house may be). Heck I might even have a day off! I do have to bear in mind though that I only get 10 weeks' maternity leave (yes that's right, WEEKS not MONTHS) and Ross gets the princely sum of 2 days paternity leave, or something like that. Crapola. 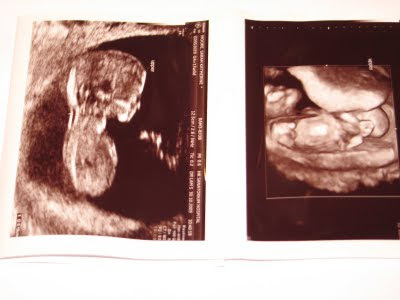 So, I had my first scan on Friday. 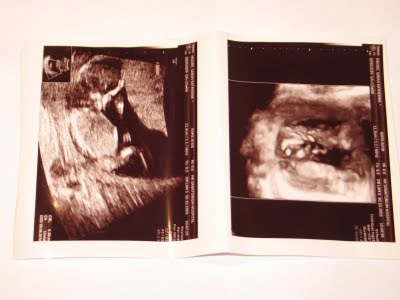 Which sounds crazy since I am only 4-6 weeks pregnant. The cynic in me would say that since scan cost $600, they offer them to anyone. Looks like having a baby in this town is going to cost a lot of money – not least because I've been to the HK Sanatorium so far (mostly because it's so close to our flat) which is a private hospital. Hospital visits here always seem to involve at least 6 procedures before you see the doctor – which might be why we didn't get to see Dr Lam until an hour after my appointment time. First you fill in some forms and hand over your ID card. Sit in the waiting rom for a bit. Then you get your temperature taken (plus optional face mask if you look a bit hot). Sit in the waiting room for a bit. Get weighed. Sit in the waiting room for a bit. Answer a questionnaire about your recent travel history and contact with poultry (no questions about your contact with pigs ha ha) Sit in the waiting room for a bit. Take a pee test. Sit in the waiting room for a bit. Finally, see the doctor! She correctly diagnosed me as very nervous, but I had Ross with me to stop me from passing out (again – I did a fainting special a couple of weeks ago at a very swanky rooftop bar in Wan Chai. Again, my hero was on duty and laid me – very gracefully apparently – on the expensive teak decking while someone got some iced water)She asked some questions, I asked some questions, then I had my scan. It was a pretty scary feeling getting up on that horrible bed thing with (shudder) stirrups. Eugh. Anyway, here's a little pic. The observant amongst you will notice that there are two blobs....at the moment it seems like only one of them is developing, but there is a chance that sometime around the middle of May 2010, the size of our family will double. Gulp. The blob is only 2mm long at the mo, so Dr Lam thinks it's 4 weeks old. I need to equip myself with a couple of books I think. Amazon will be my saviour!